Task: To improve tool-making processes by adding machining options above and beyond turret milling, the route Wilks had traditionally taken. Solution: To automate some work processes using ROBOCUT 0iE, FANUC’s CNC wire cut EDM. Result: More accurate dies within microns and accelerated manufacturing processes resulting in an over 50% reduction in production time and increased overall productivity. Wilks is a 25 strong, family run, manufacturing company specialising in the supply of PVC profiles. With a senior tool maker due for retirement later this year it seemed the ideal time to investigate ways in which we might improve our tool making process compared to our traditional use of turret milling machines. FANUC had come highly recommended to us and following a meeting with Andy Spence to discuss our requirement we immediately felt that we had found a long term partner for our tool room rather than simply making a one-off machinery purchase. Being a small company we needed to be certain that any machinery investment would yield a return relatively quickly and would not create a bottleneck in tooling schedules whilst new skills were developed. 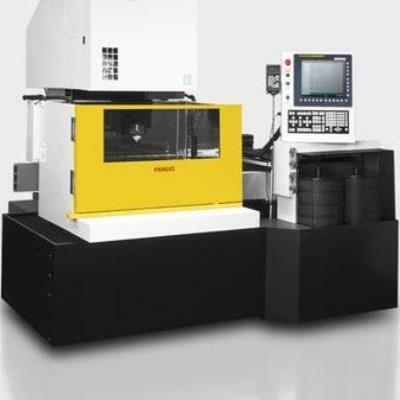 Our minimal CNC and CAD experience was of initial concern to us but with the FANUC’s reassurance, demonstrations and ultimately a training course at their UK Headquarters we felt enthused and confident in both our own ability to deliver as well as having purchased the right machine to work with. Immediately following our training the Robocut was put to work. A die that would have previously taken 40 hours to produce was programmed and set in 2 hours and cut within a further 16 hours. A time saving of over 50%. Even more impressive was that the tooling ran first time when trialled on our extrusion line and without need of tuning. The saved man hours can be spent on other areas such as R&D, product trials, tuning of tooling or the design of new dies. We are now working more efficiently and experience can only see things improve further still. Seemingly overnight we have gone from using relatively basic methods to produce our tooling to high specification. Surprisingly the step-up has been very simple too… we only wish we had followed this path years ago. Steve Waldie - Tool Room Manager: "Historically our extrusion tooling had to be made using traditional tool making skills such as split dies. The main problems we faced was blending a round hole at the back of the die to sometimes complicated rectangular shapes at the front/exit face of the die. With these problems in mind, the process of making these dies was both time consuming and not necessarily accurate. Since receiving our FANUC Robocut Alpha OiE and having completed 5 days training we were able to start cutting production dies the following week. The learning curve from a CAD and CNC Wire Eroder novice was a steep one but surprisingly rapid. The support that we received from FANUC was always there whenever we required it which in itself was very reassuring and meant that delays in completing jobs were minimal. The dies we make are now accurate within microns and the speed of manufacture has been cut by approximately 50%. Now we have our FANUC Robocut there is no looking back".